The air traffic controller who went AWOL right before the fatal collision said he didn't think he deserved to be suspended. 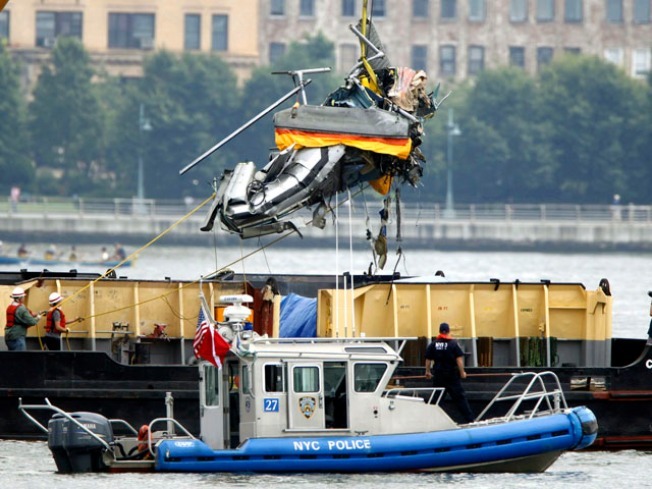 The air traffic controller who was placed on leave for not being in the tower when a mid-air collision claimed the lives of nine people over the Hudson River says he didn't deserve to be suspended, according to a published report. But Dennis Moore didn't have much of anything else to say about him being AWOL from the tower at Teterboro Airport when a small plane and helicopter collided on Aug. 8, killing five Italian tourists, a helicopter pilot and three people in a single-engine plane. "Leave me alone," he told reporters outside his North Brunswick, N.J., house. Moore's only comment came when a Daily News reporter asked whether he thought his punishment for being out of the tower when the collision happened was justified. "No," he responded curtly, according to the Daily News. Reporters asked Moore where he was when the plane collided with a Liberty Helicopters chopper, but he said he wouldn't "comment about anything," reports the News. The 55-year-old Moore and controller Turner, 38, were the subjects of a federal investigation into blunders at the Teterboro control tower just before the tragedy. Turner, who cleared the single-engine plane for takeoff, was jabbering on the phone with a female co-worker about barbecuing a dead cat minutes before the deadly disaster, transcripts of tower recordings revealed. Seconds before the collision, Turner said, "Damn," and slammed down the phone, the transcripts show. The Federal Aviation Administration has said Turner's actions were improper, but didn't appear to have had any role in the accident. Like Moore, Turner was placed on paid administrative lead while FAA authorities continue their probe. He couldn't be reached for comment, reports the News.